To the right we see the Ghats mountain range, separating the Malabar coast from the rest of the Indian mainland. The top leftmost island is Baypin. 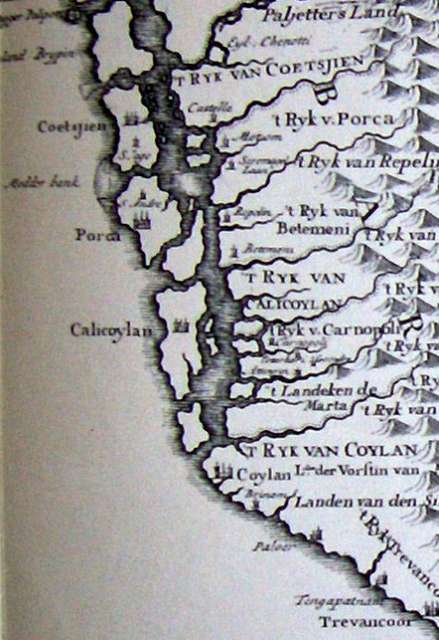 Right underneath we see Cochin (‘ Coetsjien’), and slightly further south Purracad (‘Porca’). The map also nicely shows the backwaters connecting the various Malabarese cities, which made isolation of Cochin highly problematic. Just south of the backwaters we see Quilon (‘Coylan’). Taken from Nieuhoff and displaying the situation around the time of the siege. Categories: Malabar, Quilon, map, Cochin.